Would you like to get the easiest win of your lifetime? I've got 2 winners with kind of the same build, first one on adventure mode since I was still wondering what I would do, and another one on roguelike once I had a clear idea of how to go about it. You want to get Pain Enhancement System at lvl 30, then I Can Carry The World! at 42. You're essentially an arcane blade on steroids, you use double shield and a staff on your tk slot, all of those weapons have the accuracy proc bonus built in, so you do obscene amounts of damage. You will be oneshotting everything all game long since the beginning. The only things that are dangerous are antimagic mobs (orc mage-hunter, anything with mana clash), sustain removal (dreadmasters, archmages), Champions of urh-rok too since they have passive spell disruption when hit. Probably some other things but they don't tend to stick around that long. Last edited by dadito on Mon Dec 04, 2017 10:22 pm, edited 2 times in total. Anyways, watched the twitch clips, great build, I can no longer see or hear though. Any thoughts about using Demon Seeds? Depending on how demon seed talents calculate block value for dual-shields (I don't know the answer) I feel like certain talents could be ridiculously good. Plus there's that one which gives global speed. How often can you use Osmosis Shield without Draining Assault, Drain, etc? I don't think i ever depleted my vim bar, you can certainly sustain it with the vim on kill you get by default. Also you only really need it against dangerous enemies, and there aren't many since mobs don't last that long. I tried your build and it is super, everything die 1-2 hit. I really like the Hardened Core armor + Stone Fortress combo. Do you have a similarly strong build that can be used in the Embers of Rage campaign (no dwarf)? I can't finish it, the endboss always kills me, but I finally want revenge with an op char. (It doesn't need to be an Arcane Combat centered build.) Thank you! My favorite EoR build is still demonbutcher. Basically, steamsaws count as shields for the purpose of talents like Demon Seed, so you just get Butchery, Demonic Pact and further stuff that you like. I recommend getting Demonic Strength personally, since it is very easy to keep up the vim for Abyssal Shield. Also, Tempest of Metal works with Arcane Combat, meaning you can potentially get a lot of triggers - but you also run out of resources very fast. I'm actually playing a build similar to what Erenion describes in the AoA campaign right now. It's very strong once you get it running. I did a version without Arcane Combat though, since I've played a number of AC/Adventurer builds already. You can put a third weapon seed on your TK weapon (it's a staff, of course), so for instance I was rolling Corrosive Cone + Blood Grasp + Flame Bolts. Since the seeds grant the talents to YOU and not give them to items as on-hit procs, it doesn't matter if you're actually using BtF to attack with the TK slot or not (not). Actually, the warden version with shields is much more powerful than with steamsaws. 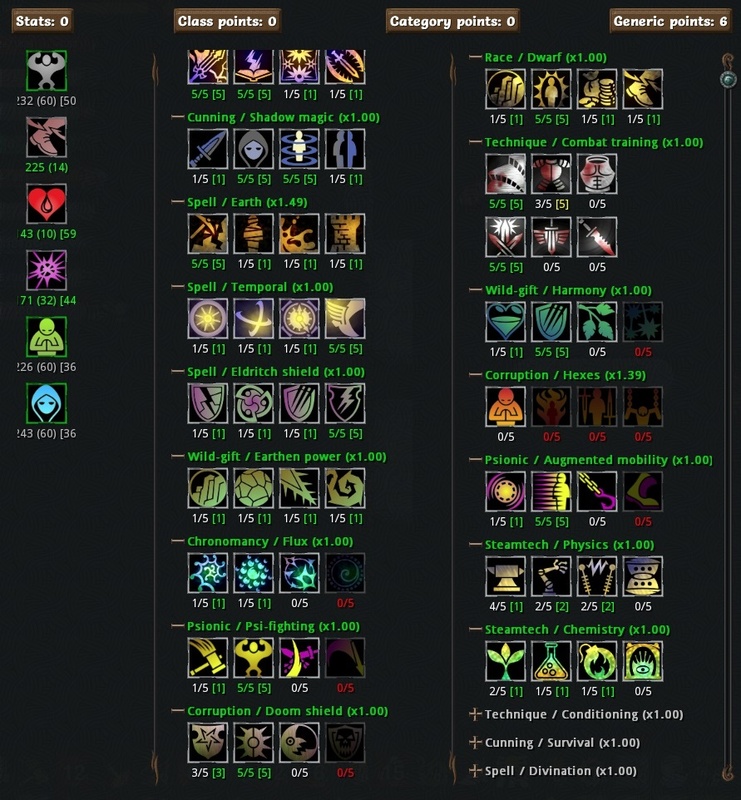 Shields are talented like staves, which means that procs from arcane combat are increased by 2.5% times acc-defence, while for steamsaws it just increases the crit chance like axes, and it is useless when you have reached 100% crit chance. With a high accuracy, you can get insane procs (like an arcanereaver with short staves). On late game, on the (defenceless) dummy trainer, I got spells that dealt 15000 *each*, while the direct applications of those spells (or an application while replacing shields with steamsaws) was around 5500. I also recommand taking Demonic Strength. Abyssal shield is great in term of defence, but Demonic Blood is very powerful offensively, as the extra damage that its adds is applied multiplicatively. If you have, say 50% damage modifier for a certain element and 50% from Demonic Strength, your final damage will be 1.5*1.5=2.25 (and not 2). And it applies to all damage, of course. Why not max Magic instead Willpower? Mana? I think since he gets a lot of spellpower from Strength and Cunning, and spellpower has diminishing returns, maxing Magic wouldn't result in that much actual damage. Willpower increases mana, lowers equilibrium fail chance, and increases how much vim you gain per kill. Not that it matters much for this build, but Willpower also determines your melee damage with shields when using Beyond the Flesh. Last edited by Effigy on Sat Dec 09, 2017 11:11 pm, edited 2 times in total. More Willpower = more Strength from Augmentation = more Spellpower from Harden and more damage from PES. I'm gonna try fitting Demonic Pact and Demonic Strength in there. Probably dropping Flux (Abyssal Shield will handle the whole damage reduction thing) and Temporal (it's good but I can't stand the three useless skills in this tree) or Augmented Mobility (you have to get those generics from somewhere).